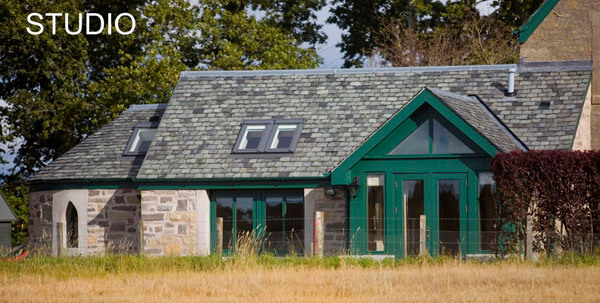 In the heart of Perthshire, in the small village of Dunning, sit these bespoke and individual properties providing luxury accommodation for couples. The setting is idyllic, surrounded by beautiful gardens and woodland, looking over fields, a golf course and up into the Ochil Hills. They are situated minutes from the A9 (Scotland's main artery road) so immediately accessible for Edinburgh, Glasgow, the Highlands and the East Neuk of Fife. 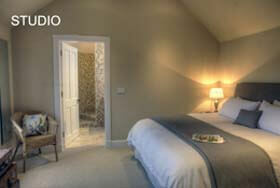 Both properties are designed to help you unwind, relax and enjoy every moment. It's the perfect place to spend a romantic weekend, a short break or ideally take a longer time to fully explore the surrounding areas and beyond. 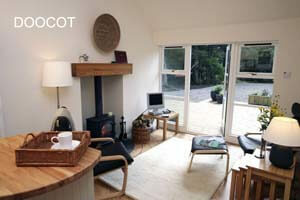 The Doocot is a delightful and secluded cottage, set in woodland beside an 18th century Doocot. It sits in the tranquil grounds of the owners' own home, far away at the opposite end of the garden with woodland on one side and well-kept garden on the other. You can relax on the deck, reclining on the patio furniture and look endlessly out over the fields and golf course, watching the local wildlife come and go - red squirrels, woodpeckers and even the odd deer. A beautifully peaceful spot. 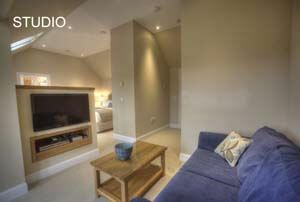 The Studio is a bright airy open space, tastefully decorated and with every detail and comfort provided for. It is attached to the owners' home but completely independent with its own front door and a south facing sun trap of a private garden - if you want to relax overlooking fields and hills then this is the place. A wonderfully romantic bolt hole with every amenity and complete privacy. The conservation and historical village of Dunning is in the centre of rural Perthshire. It is home to the 13th century St Serf's Church, with the rare and very impressive 8th century Dupplin Cross and some ancient woodland which was once the site of a 1st century roman camp. Just outside the village is Maggie Wall's monument, the site of the last witch ever burnt in Scotland in 1657. Within the village The Kirkstyle Inn provides delicious bar meals and evening meals in their dining room and while The Dunning Hotel does the same, it also has live music during the summer months. There is also a small grocers and a post office in the village and within a few miles is the world renowned Gleneagles Hotel. Perthshire is a fantastic county to explore, there is everything from wildlife to adventure. There is fishing, stalking, shooting, water sports, cycling, walking, munros to climb, golf to play, distilleries to visit, castles to explore and much, much more. 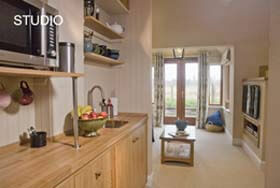 The Doocot interior is a calming one and every little detail has been thought out and provided for. You enter through the conservatory into the kitchen and living area. 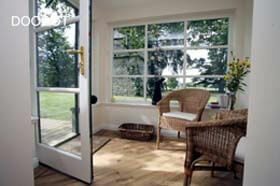 The cottage is heated with a Stovax wood burning stove and there is a plentiful supply of logs right outside your door. There are radiators to give background heat so the stove is not required unless you choose to use it. There is a flat screen television, Blue Ray DVD, Freeview, DVDs, books, Bose Ipod dock and games. The kitchen/dining area is well equipped with beech worktops and a dining island in the centre. It is a well-appointed kitchen with an electric oven and hob, microwave, fridge with small freezer compartment and a washer/dryer. 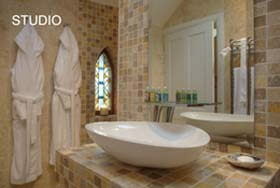 There are dressing gowns and fluffy towels, a lovely big curved shower bath and Arran Aromatic bath and body products. 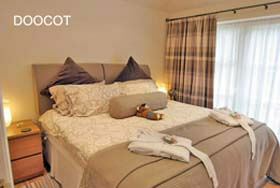 The bedroom is bright and airy with full length windows and a super king size bed with luxury linens. The Studio is a modern and bright airy space where every comfort has been thought of. The walls have been painted in gentle Farrow and Ball colours and the fabrics mirror the understated elegance of the interior. There is underfloor heating throughout. You enter by the French doors into the sunny open plan sitting area with a comfy sofa, wall mounted 36 inch flat screen telly, Blue Ray DVD player, freeview, Ipod with ceiling speakers and free wifi. There are plenty of DVDs, books and games. The kitchen area is tucked away and beautifully finished with beech worktops. There is a fridge/ice box, microwave, toaster, kettle, and sink plus all the essentials for making a tasty breakfast or a light supper. The bed is super king size with sumptuous linens and unbelievably comfy. The bathroom is built on the round, with stained glass windows and a magnificent shower with a large rainfall head plus four body jets and a hand held shower. There are fluffy towels, dressing gowns and shower and body products by Arran Aromatics. 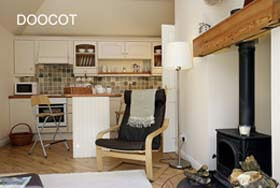 The Doocot and The Studio are about an hour by car from both Edinburgh and Glasgow airports. The nearest railway stations of Perth or Gleneagles are about 10 minutes away. Detailed directions will be sent on booking. The price includes electricity, logs, wifi and dressing gowns. Also some tasty baking and homemade jam to welcome you (some of our very own Damson Gin awaits tasting too! ), fresh flowers plus some milk in your fridge for a cuppa when you arrive. There is a plentiful supply of tea, coffee, sugar, oils, salt and pepper. Loo rolls, cling film, foil, firelighters, matches, washing up liquid and cleaning products are provided too. Ideally changeover day is a Saturday and check in is 4pm and check out is by 10am. If you have other requirements, we'll do our best to accommodate everyone so please just ask. 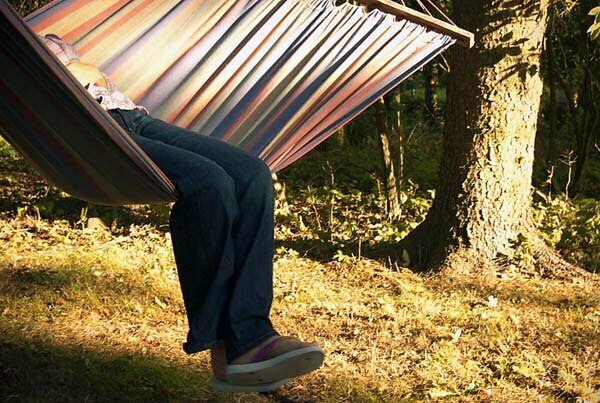 Weekend, short breaks or midweek hideaways are all available. Dogs are by arrangement. To book either of these luxurious self catering properties in Dunning, click the enquiry button below to view availability and prices. 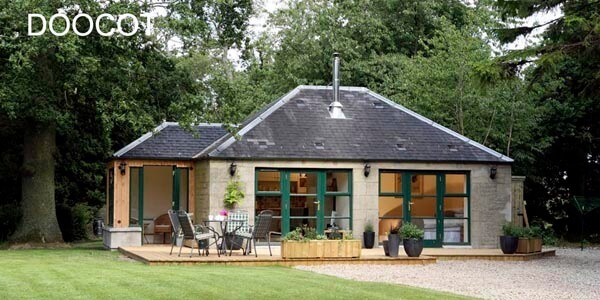 These gorgeous holiday cottages for 2 offer lots of comforts and extra touches so you have a very relaxing break in the Perthshire countryside. Easily accessible (Edinburgh and Glasgow airports are just an hour away) they are perfect for a really luxurious break.